As part of this blog’s ongoing theme of all things TV in 1978 – to coincide with tonight’s presentation of the 50th annual TV Week Logie Awards, let’s have a look at what they were doing at the 20th TV Week Logie Awards presentation, thirty years ago. The 1978 TV Week Logie Awards were held at the Southern Cross Hotel, Melbourne, on Friday 3 March. The presentation was hosted by Bert Newton and telecast through the Nine Network. The telecast was sponsored by the national telecommunications carrier Telecom (now Telstra). The winner of the Gold Logie for Most Popular Personality on Australian TV was Graham Kennedy, host of the popular late-’70s game show Blankety Blanks. Kennedy had stiff opposition for the award, fending off other nominees Don Lane, Bert Newton, Mike Walsh and Lorraine Bayly. 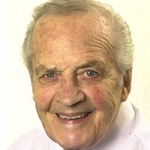 This was Kennedy’s fifth Gold Logie which was a new record – but it would be twenty years before he would win another one, when he was inducted into the TV Week Logie Awards‘ Hall of Fame in 1998. Kennedy had also won another Logie earlier in the night in ’78 when Blankety Blanks was awarded Best Australia Variety/Panel/Comedy Show. But while Kennedy was the winner of the night’s top award, he was upstaged by six-year-old Beau Cox who had won the award for Outstanding Performance by a Juvenile for his performance in an episode of the Seven Network‘s Young Ramsay. It was also a big night for the popular Nine Network series The Sullivans, picking up five Logies, including Most Popular Drama, Most Popular Actor (Paul Cronin) and Most Popular Actress (Lorraine Bayly). 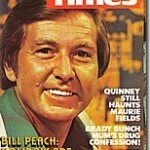 Overseas celebrities to feature at the 1978 TV Week Logies were Florence Henderson (then starring in The Brady Bunch Variety Hour), Mike Farrell (MASH), Richard Anderson (The Bionic Woman), Pattie Weaver (Days Of Our Lives), British TV host David Frost, and legendary performer Sammy Davis Jnr. The presentation also featured a link-up to Sydney to feature an interview with Bob Hope who had been touring Australia and was about to head back to the US to host the Academy Awards. MASH star Mike Farrell had made an on-air appeal for a gentleman who had taken a fall earlier in the week in the Melbourne CBD following an altercation with Farrell’s daughter Erin. In the confusion that followed the incident, the man did not give Farrell his name, hence the Logies night call for the man so that Farrell could “buy him a drink”. Then, within an hour, Melbourne man Don Sinclair arrived at the Southern Cross Hotel. “One day you are an avowed fan of MASH and the next day you’re having an accident with BJ Hunnicut’s daughter,” said Sinclair after arriving at the hotel. And yes, he got his drink. Mark Holden was awarded Most Popular Teenage Personality, but was curiously not present to collect his award. It was later revealed that the pop singer and former The Young Doctors star had made a quick dash outside the ballroom but failed to return in time to accept his award. Melbourne’s Mary Hardy (pictured with host Bert Newton), in accepting her Logie for Most Popular Female Personality in Victoria, jokingly acknowledged: “I really have to thank Graham Kennedy for this. If he hadn’t got me the sack at GTV9 all those years ago, I would not have gone to Seven!” After her acceptance speech, Hardy then felt a tug at her skirt on her way back to her seat. She turned and found it had come from Florence Henderson who smiled and threw her arms around Hardy, saying “I thought you were marvellous.” For one of the few times in her life, Hardy was lost for words. The two had never met before and Henderson’s compliment was based solely on Hardy’s on-stage acceptance speech. Now these days there is just as must emphasis placed on the red carpet arrivals and the fashions as there is on the actual awards themselves. 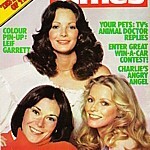 But in 1978, TV Week’s only coverage of some of the fashions of the night was a two-page spread featuring Cop Shop‘s Lynda Stoner (pictured), The Sullivans’ Susan Hannaford (shown to be arriving with Mark Holden, triggering stories of a possible romance between the two), and sisters Carmen and Paula Duncan – but the biggest shock frock of the night came from A Current Affair host Sue Smith, who wore a revealing black gown split to the hip. The strapless top half of the gown was more revealing. For a presenter who was better known for her serious approach to current affairs, it took many in the crowd by surprise. In total, 43 awards were handed out on the night. The Nine Network claimed twenty awards, the Seven Network claimed eight Logies, while the 0-10 Network picked up four, and ABC picked up five. Hobart’s TVT6 picked up the three Tasmanian state awards, and Newcastle’s NBN3 won the regional TV category. Source: TV Week, 11 March 1978 & 18 March 1978. * GTV9 Melbourne. Other stations/affiliates check local guides. What a terrific capture of a time. I especially liked the Florence Henderson and Mary Hardy hug. Florence may of course, have had a drink. That little Beau Cox kid was very endearing in a commercial, possibly involving Band-Aid plasters. “I used to be BIG when I was small”.